Easter is celebrated in Italy by eating eggs and lamb. As a starter for our Easter dinner, I decided to make a sous-vide version of an Italian antipasto called Asparagi alla Milanese. 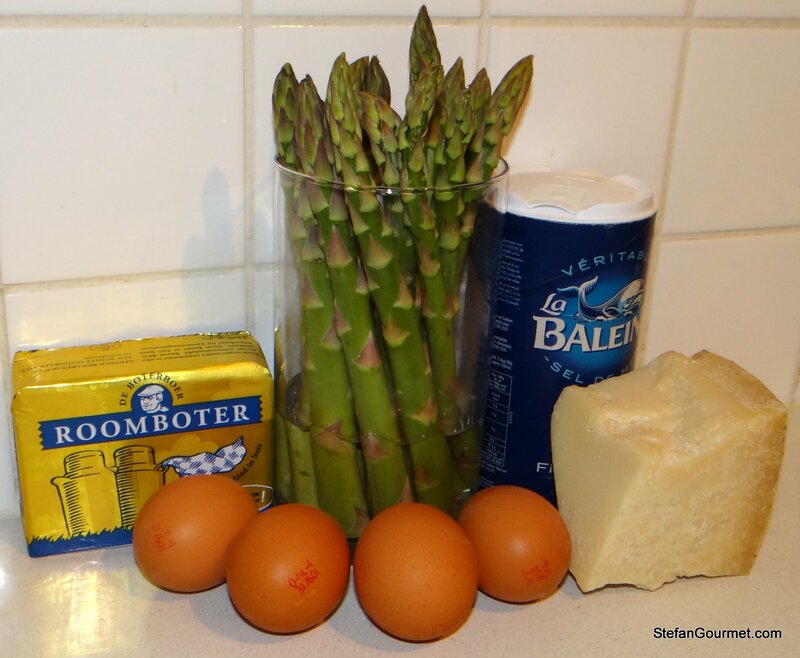 This is simply green asparagus with a fried egg, melted butter and grated parmigiano reggiano. For the sous-vide version I cooked the asparagus sous-vide at 85C/185F for 15 minutes and the eggs 45 minutes at 64.5C/148F. The resulting egg is like a poached egg, but with a very nice texture. 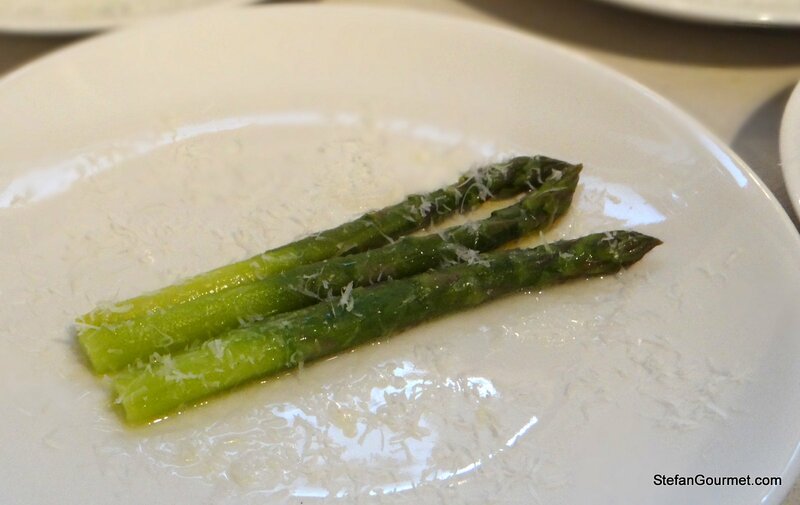 The asparagus are tender but firm to the bite with a nice full flavor. 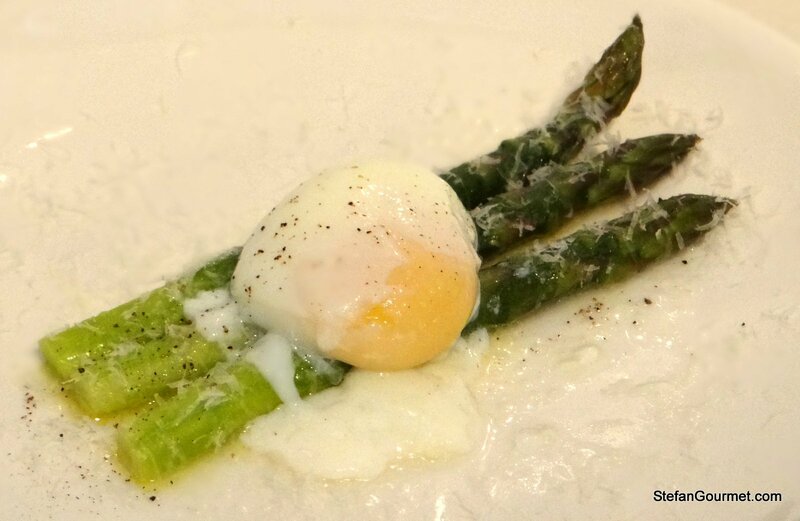 If you don’t have sous-vide equipment, you could of course prepare this in the traditional way by poaching (or indeed frying) the eggs and steaming or boiling the asparagus. 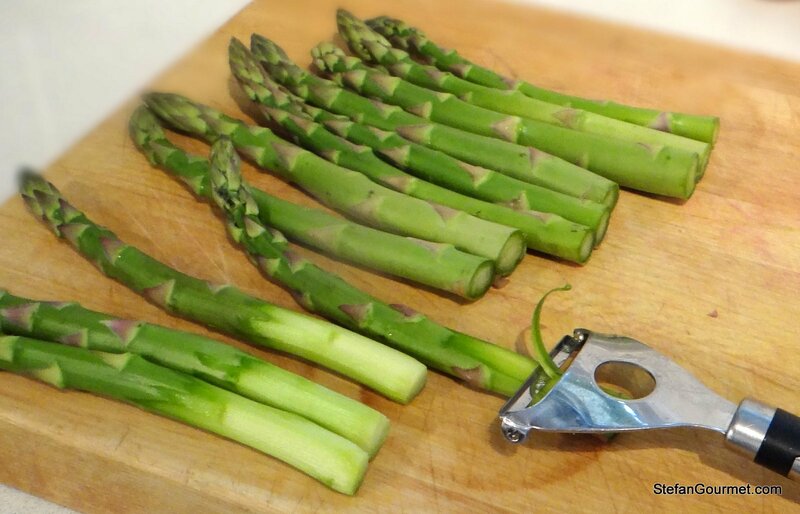 Cut the woody end off each asparagus and cut them all to the same length. Peel the bottom part of the asparagus, where the skin is tough. 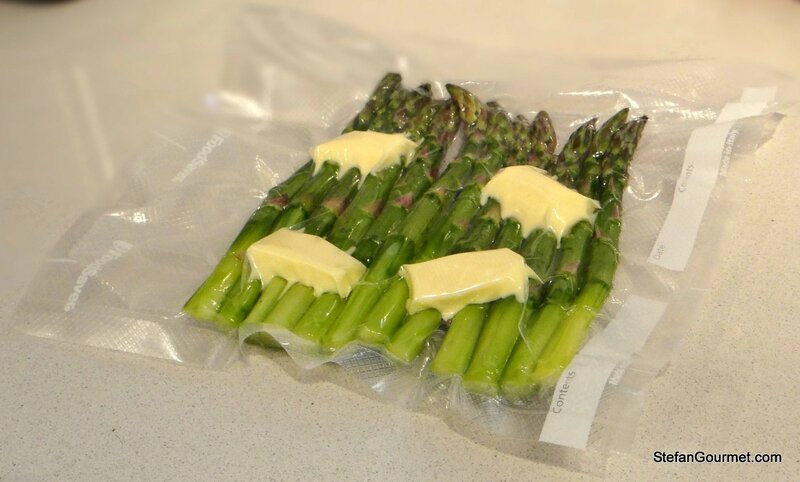 Vacuum seal with the butter. Cook sous-vide at 85C/185F for 15 minutes. Set the temperature of the water bath to 64.5C/148F and add cold water to the water bath to cool off the water quickly to this lower temperature. 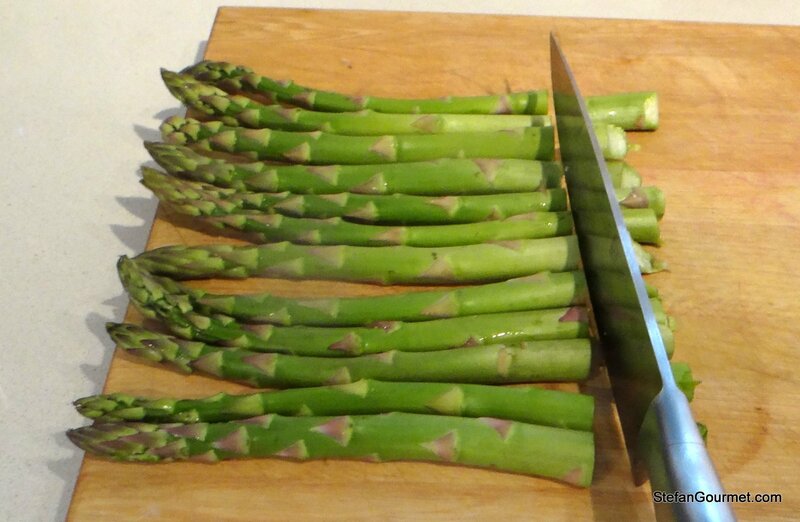 The asparagus can stay in the water bath to stay warm, they will not continue to cook at such a low temperature. Gently lower the eggs into the water bath (there is no need to vacuum seal them, that would actually be a bad idea…) and cook sous-vide for 45 minutes at 64.5C/148F. Meanwhile, preheat 4 plates in the oven to about 100C/220F. 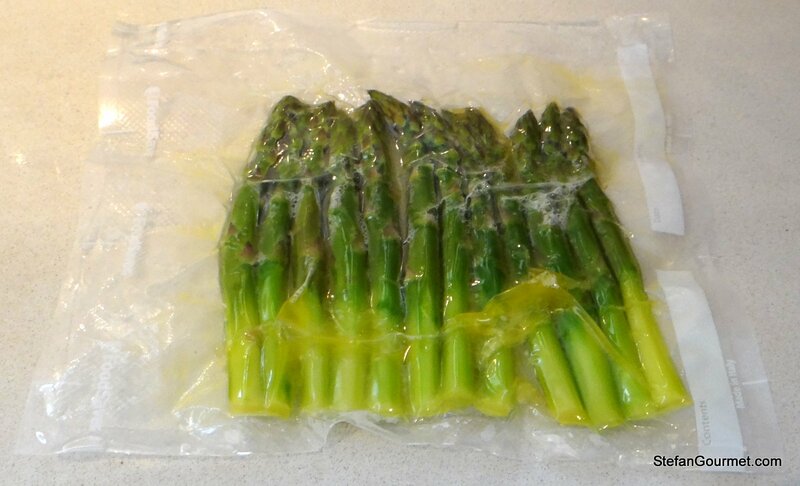 Take the asparagus out of the water bath and remove them from the pouch, reserving the melted butter from the pouch. 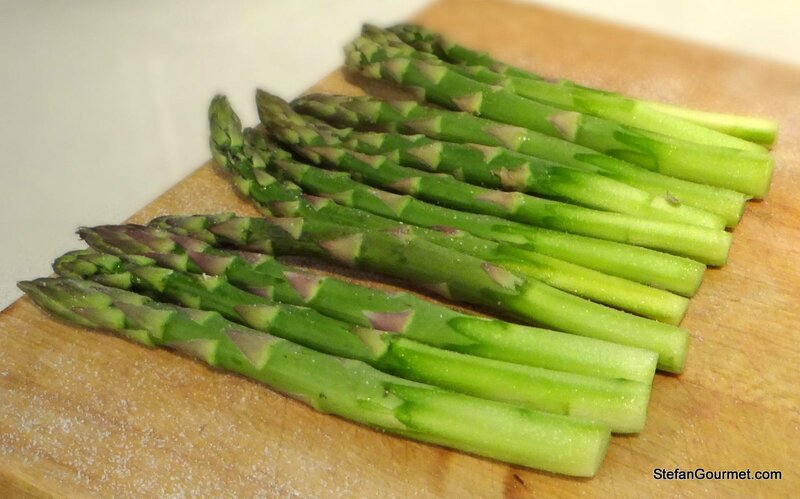 Arrange 3 asparagus on each plate and spoon over some of the reserved melted butter. Sprinkle generously with freshly grated parmigiano reggiano. Now remove the eggs from the water bath and gently crack the shells and arrange an egg on top of the asparagus on each plate. Season with salt and freshly ground black pepper, and serve immediately. 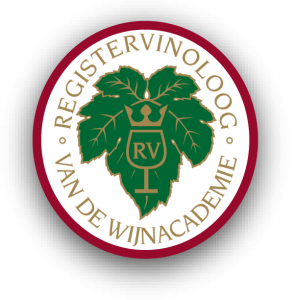 We enjoyed this with a nice glass of good champagne. A Franciacorta (sparkling wine from Lombardia, the region of Milano) would be even more appropriate. This looks yummy and elegant and looks easy to make! Thanks Claire, for visiting and taking the time to leave such a nice comment! The classic dish around here is white asparagus with hollandaise, eggs, ham, and parsley. The asparagus season is supposed to have started, but it’s been so cold that they are late this year.